Babies and toddlers require an incredible amount of 'stuff' both at home, and when you're on the go: bottles, teethers, pacifiers, diapers, wipes... the list never ends! A diaper bag is quintessential gear for a parent, and we've rounded up several stylish green options that don't scream "changing pad inside." These roomy and appropriately functional bags for moms and dads will tote all of baby's gear in an organized and eco-friendly fashion! While Sparrow Handbags aren’t specifically designed for toting diapers and bottles, they’re big enough to stylishly accommodate everything you need when your baby is in tow. The British Columbia-based company doesn’t hold back when it comes to eco-conscious design. The vegan bags are made from organic cotton and hemp, dyed with low impact dyes, and bottoms are made from historically hard to recycle tetra boxes. 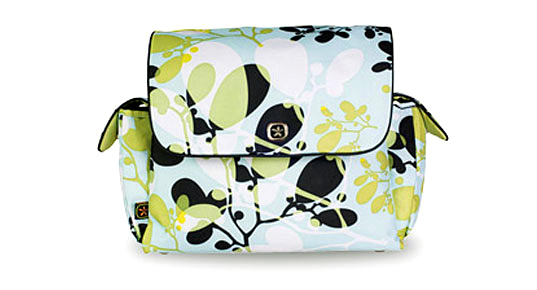 To keep up with the green movement, glam baby gear company Fleurville gave their MotherShip Bag an eco makeover, resulting in the ReRun Messenger. Made from recycled PET fabric, each bag saves roughly ten 600ml water bottles from a trip to the landfill. The bags come in several cool clean graphically designed styles with a changing pad, wipe case, carabineer and lots of elastic topped pockets inside. 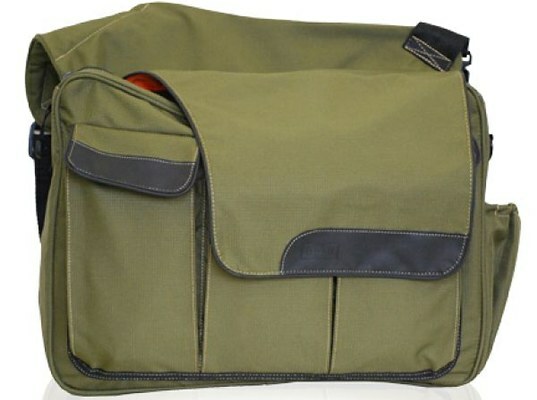 This durable recycled PET messenger bag is made by a dad, for dads. The Diaper Dude style is unassuming and highly functional for men, offering plenty of pockets for baby goodies and electronics, a changing pad and a elasticized bottle pocket. From Brazilian designer Gabi Goncalves (for Maria Buzina), this Recycled “Briage” Diaper Bag Tote is bound to draw attention — in a good way. 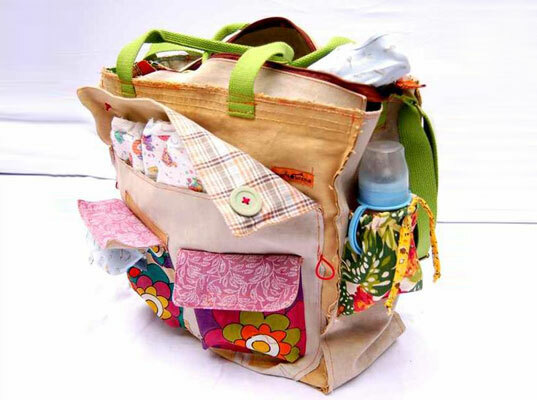 And when other moms ask you about your patchwork bag you’ll have an interesting story to tell them. Goncalves uses recycled cottons and donated truck tarps to create one-of-a-kind, handsewn, hand-painted bags. With lots of room and compartments, this bag has potential to stick around through toddlerhood and beyond. Made from 76% recycled materials, Alchemy Goods’ Urban Messenger Bag isn’t made to be a diaper bag, but we think it’s just as good as the competition. Recycled inner tubes create the 100% waterproof exterior of the bag — perfect for spills and typical baby messes — and the strap is a scrap yard salvaged seat belt. When you order a bag, you’ll also get to choose from six color choices for the inner lining fabric. While Sparrow Handbags aren't specifically designed for toting diapers and bottles, they're big enough to stylishly accommodate everything you need when your baby is in tow. The British Columbia-based company doesn't hold back when it comes to eco-conscious design. The vegan bags are made from organic cotton and hemp, dyed with low impact dyes, and bottoms are made from historically hard to recycle tetra boxes. From Brazilian designer Gabi Goncalves (for Maria Buzina), this Recycled "Briage" Diaper Bag Tote is bound to draw attention -- in a good way. 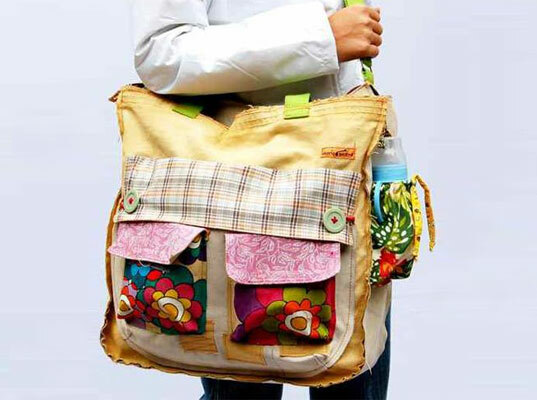 And when other moms ask you about your patchwork bag you'll have an interesting story to tell them. Goncalves uses recycled cottons and donated truck tarps to create one-of-a-kind, handsewn, hand-painted bags. With lots of room and compartments, this bag has potential to stick around through toddlerhood and beyond. Made from 76% recycled materials, Alchemy Goods' Urban Messenger Bag isn't made to be a diaper bag, but we think it's just as good as the competition. 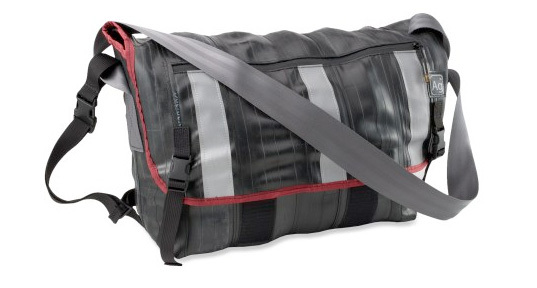 Recycled inner tubes create the 100% waterproof exterior of the bag -- perfect for spills and typical baby messes -- and the strap is a scrap yard salvaged seat belt. 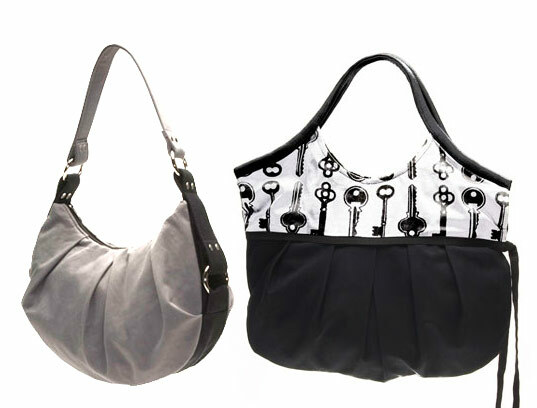 When you order a bag, you'll also get to choose from six color choices for the inner lining fabric.